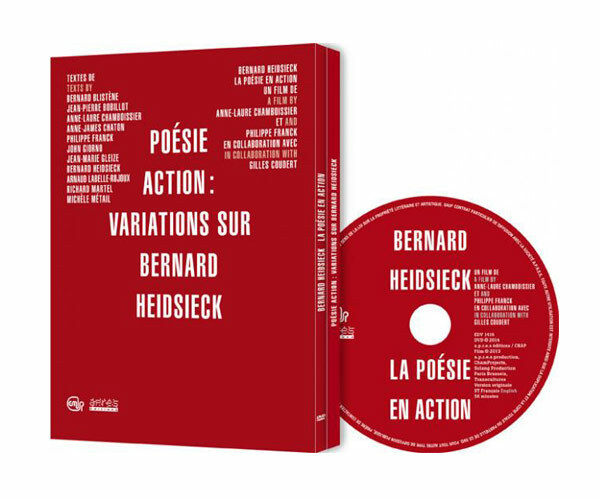 This documentary film directed by Anne-Laure Chamboissier and Philippe Franck, in collaboration with Gilles Coudert, brushes an intimate portrait of Bernard Heidsieck, pioneer in the sound poetry movement since 1955 and founder in 1962 of action poetry. The film takes viewers into Heidsieck’s “double life” as an artist and a banker, exploring his work through a series of conversations and seldom-seen audiovisual archives. Bernard Heidsieck, a poet in action. Or a collection of works by Bernard Heidsieck selected from the Centre national des art plastiques collections and presented by Anne-Laure Chamboissier and Philippe Franck at the Sonopoetics exhibition in Brussels, in 2010. Or a desire to meet a pioneering artist and explore his unique corpus. Or testimonials from a circle of artists. Or a film to affirm the importance and currency of this major corpus. Or an anthology of original contributions from Bernard Blistène, Jean-Pierre Bobillot, Anne-Laure Chamboissier, Anne-James Chaton, Philippe Franck, John Giorno, Jean-Marie Gleize, Bernard Heidsieck, Arnaud Labelle-Rojoux, Richard Martel and Michèle Métail.